Specifications: Qmax 2.5m³/h, Qmin 16L/h Mechanical Register of Total Flow in m ³ Rugged die-cast aluminium construction. Height- 197mm, Width- 128mm, Depth- 110mm. 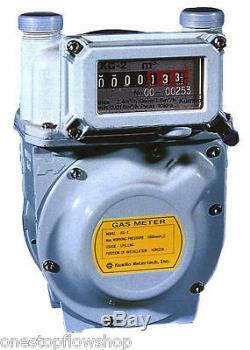 Suitable for secondary metering of: Natural Gas, Town Gas and LPG. Compact strong aluminium die cast construction High sensitivity suitable for low gas flow rates Pulse lead supplied & fitted. If you have any questions please don't hesitate to ask. The item "½ Diaphragm gas meter, secondary billing, Natural Gas, LPG, Air, Nitrogen Pulsed" is in sale since Friday, January 30, 2015. This item is in the category "Business, Office & Industrial\Test, Measurement & Inspection\Test Meters & Detectors\Other Test Meters & Detectors". The seller is "onestopflowshop" and is located in Buckingham. This item can be shipped worldwide.